Now approaching the 1000th time it has been taught, the continually-improving and intensive Emergency Department Echo (EDE) Course is still raising the bar for medical care and training in Canada. EDE founder, Dr. Ray Wiss, wanted to train the average doctor to use ultrasounds to look for basic things that could have a dramatic effect on patient care.“We want to use ultrasounds the same way that nurses use stethoscopes,” explained Dr. Wiss. After discovering the training available in Canada at the time was insufficient, the internationally-recognized physician from Sudbury, ON. designed the and launched the EDE course in 2001. 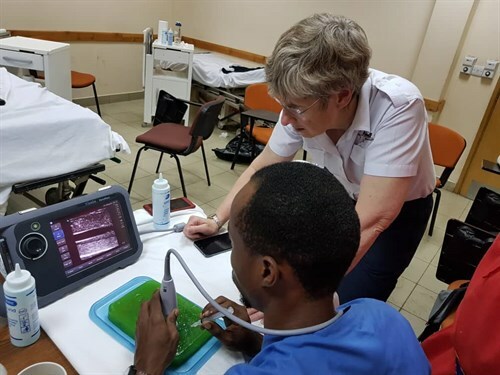 Since then, the EDE Course has grown rapidly in popularity due to its complete approach: from picking up the ultrasound probe for the first time, to scanning for life-threatening complications that may not be visible from a preliminary external examination. Dr. Wiss said doctors often have to make a decision on care based on risk level, particularly in rural hospitals, essentially “rolling the dice” due to the cost, distance, or availability of equipment or specialists outside of communities. This leaves the doctor wondering if they made the right call, even if the risk for complication is small. For example, perhaps a patient in a rural location comes in with belly pain. “There’s no way they’ve got an aneurysm – but (as a doctor), you’ve thought about it,” Wiss said, adding the risk is low so the doctor may decide against calling in a specialist or sending the patient to another community for additional tests if they show no other concerning symptoms. However, with bedside ultrasound, the doctor can change the conversation to, “I’m going to take a look at your aorta”, and accurately assess risk at the patient’s bedside. “That’s the huge benefit of EDE: it turns a low-risk patient into a no-risk patient,” Dr. Wiss added, which improves the prognosis for patients as well due to early detection. Bedside ultrasound can determine if there are complications from blunt trauma to the chest or abdomen, take a look at the heart, check for fluid in the stomach from liver or kidney failure, detect ectopic pregnancies, or look for enlarged livers or spleens. “Ultrasound will transform the way we practice medicine in virtually every way,” Wiss said. This month, RhPAP is sponsoring a “boot camp” style course in Claresholm that kicks up the intensity another notch. On October 12 and 13, area doctors will be participating in the first of four days designed to introduce, train, and equip doctors to use ultrasound equipment. The final two days will be held early in 2019. “After four days if you’ve done all your homework and you’ve qualified, you get your certification,” said Dr. Roisin Dempsey, organizer of the Claresholm event and local doctor. 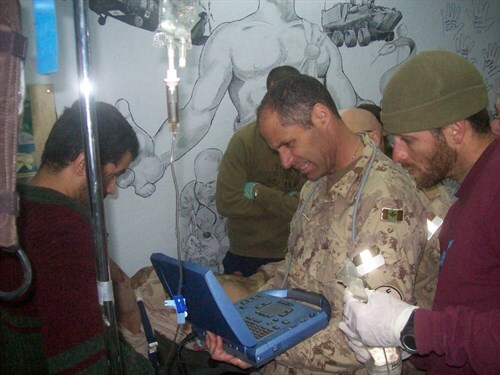 The Claresholm Hospital has a portable ultrasound machine, donated by the Claresholm and District Health Foundation, but none of the doctors are trained. “It seems very silly to have a very valuable machine and not the skills to use it,” she said. After being inspired by seeing the outcome of a recent RhPAP-sponsored course in Brooks, she began the process of bringing one closer to home. RhPAP Board chair, Dr. Rob Warren, a practising physician in Sundre, is a huge advocate for the course. “The focus of the EDE Course is to introduce safe scanning techniques to physicians, and encourage them to continue practicing and developing their skills to the point of achieving Canadian certification, which is recognized as being the highest and most rigorous certification standard in the world,” Warren said. For more information on the EDE Course, visit www.edecourse.com.